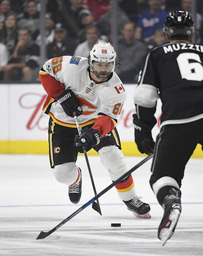 Sean Monahan scored 1:02 into overtime and the Calgary Flames rallied for a 4-3 victory over the Los Angeles Kings on Wednesday night in Jaromir Jagr's season debut. Matthew Tkachuk scored two goals and tied it with 9:01 left in the third period for the Flames, who have three wins in their first four games. Mike Smith's scoreless streak ended just shy of 140 minutes, but the veteran goalie made 42 saves. Dustin Brown scored the tying and go-ahead goals on artful deflections early in the third period for the Kings, who lost for the first time under new coach John Stevens. Captain Anze Kopitar also scored, and Jonathan Quick made 33 saves. Michael Frolik also scored for Calgary, and Monahan ended it with his second goal of the season. The 45-year-old Jagr played 15 shifts and didn't record a shot on goal, but still nearly scored on his opening shift in a solid debut with the Flames. The second-leading scorer in league history began his 24th NHL season by suiting up for his ninth NHL franchise and immediately making an impact. After Tkachuk and Frolik scored in the first period, Kopitar got the Kings going in the second with his third goal in LA's three games. That's the quickest goal-scoring start to a season for the Kings captain since 2011-12, when he scored 76 points and led Los Angeles to the Stanley Cup title. Rookie forward Alex Iafallo got his first NHL point on Brown's tying goal 14 seconds into the third period. Brown deflected Drew Doughty's shot for that first goal, and he expertly redirected Derek Forbort's shot for the go-ahead goal 1:44 later. Brown is off to an outstanding start after a rough few seasons with the Kings, who stripped the two-time Stanley Cup champion's captaincy last year. The physical forward needed 17, 34, 19 and 15 games to score his first three goals in each of Los Angeles' previous four seasons. But Tkachuk tied it later in the period, whistling a shot past Quick's pad for the second two-goal game of his career. NOTES: The Kings' loss leaves the expansion Golden Knights as the only unbeaten team in the Pacific Division. Vegas is off to the first 3-0-0 start by a first-year franchise in NHL history. ... The LA Galaxy's Romain Alessandrini dropped the ceremonial first puck. 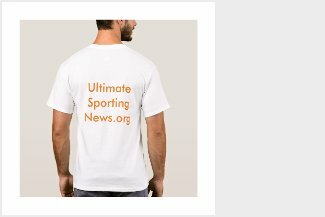 The French winger has been the brightest spot in a dismal year for the five-time MLS champion franchise, racking up 11 goals and 10 assists in his outstanding in his first season in the U.S. ... Kings F Kyle Clifford left in the second period with an upper-body injury.